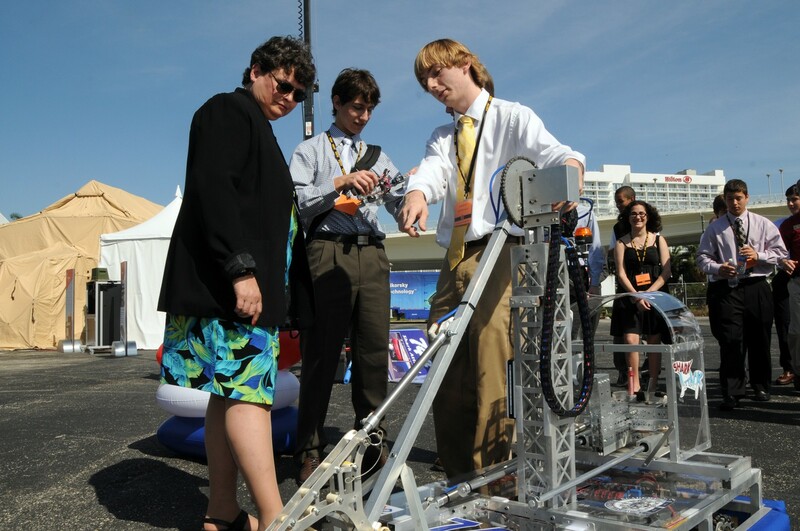 FORT LAUDERDALE, Fla. (Feb. 28, 2012) -- More than a dozen teens, part of robotics team "Shark Attack," demonstrated their engineering talent outside the convention center here alongside military hardware from the likes of defense contractors Boeing, Oshkosh and Sikorsky. The teens, from Westminster Academy in Fort Lauderdale, Fla., demonstrated the robot they built to Marilyn Freeman, the deputy assistant secretary of the Army for research and technology, during the Association of the U.S. Army's Institute of Land Warfare Winter Symposium and Exposition, Feb. 22-24. Marilyn Freeman, the deputy assistant secretary of the Army for research and technology, talks with Andrew Danielsen, a student at Westminster Academy in Fort Lauderdale, Fla. Danielsen is captain of his school's robotics team, called "Shark Attack." During the Association of the U.S. Army's Institute of Land Warfare Winter Symposium and Exposition, Feb. 22-24, 2012, Danielsen and his teammates demonstrated the robot they had built to compete in last year's "FIRST Robotics Competition." "When you look at these students, their faces, and you see their excitement about something they have accomplished using the knowledge they have gained in the classroom in science, technology, engineering, physics and mathematics, and they are putting it to an application, building a robot that can do things they never thought about doing before, it's really exciting," Freeman said. "I see eagerness in learning. I see eagerness in working together, which is an essential piece of success in the world." The high school robotics team competes yearly in the "FIRST Robotics Competition," an international competition for high school teams. At the AUSA conference this year they demonstrated their robot from last year's competition, as this year's robot is now getting ready to compete in the upcoming round of competition. As part of their demonstration, the robot picked up large inflatable loops, similar to swimming pool toys, lifted them high in the air, and placed them on their instructor's outstretched arms. The challenge last year for this robot was to do something similar. This year, their robot was designed to do something completely different than what the one did last year, said the team's faculty instructor. "We have a new robot that plays basketball," said Kent Stolley, Westminster Academy's science and physics instructor. The competition this year, called "Rebound Rumble," meant robotics team Shark Attack had to develop a robot that could put as many basketballs as possible into hoops to score points. "We've been working day and night for six weeks to build the current year's robot," Stolley said. The team finished just this week. Amongst the 36 members of the Shark Attack robotics team are students that Stolley said are skilled across a variety of technical areas. "We've got about three of four kids that when they handle tools, it's artistry," he said. "Each of these kids is here because they have some amazing talent, and they've used it for our team." One of those kids is the team captain, Andrew Danielsen. Stolley said Danielsen excels in computer programming, which the team used, in part, to tell the robot how to complete this year's challenge. But Danielsen said as team captain, his role is more than just programming. "It involves sort of generally organizing all the student aspects of the team," he said. "I work with all the different subsystems while designing, building, and programming all the different parts that entail building the robot." Not all the team members are involved in technical ways, Danielsen said, though he expects about half of his teammates will eventually end up in some technical field later in life. There are those involved in media and event scouting, he said. But more than the programming that he excels at, he said, it's the leadership experience he's learning. Freeman spoke with the high scholars about their project and about science, technology, engineering and mathematics education. She also gave each of the students her military coin. She also commented on the diversity of the team, all age groups and both males and females. "It's a great tribute to our youth to find kids like this who exist around the country, that they really are able to do and apply themselves," she said. "These kids give me great hope for the future." She also said that she imparted on the students the importance of education, and said that "parents, adults and national leaders need to encourage education. We need to show our students how much we value education and what it does for you. When you get an education, nobody can take that away from you." Freeman became the deputy assistant secretary of the Army for research and technology in July. She is responsible for the entirety of the Army's research and technology program, which spans 16 laboratories and research, development and engineering centers, with more than 12,000 scientists and engineers. She previously served as the director of the U.S. Army Natick Soldier Research, Development and Engineering Center.